This is a cool jeweled dermal top. This item fits into a 14 gauge dermal anchor. The anchors are sold separately. This item is made up of 316l Surgical Steel. 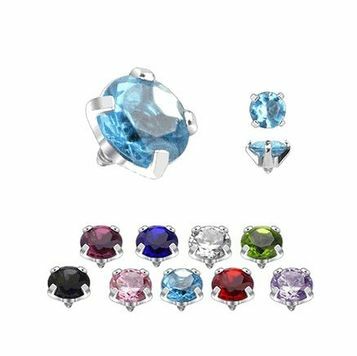 This item comes in many different jewel colors. The color available is purple, blue, clear, green, black, pink, aqua, red, and tanzanite. This item is sold separately. Item is nickel free.